“As of this release (V987), Waves MultiRack will no longer run internally on any SD Series console. There is now the ability to control Waves MultiRack running on a separate PC or Mac from your SD console. “We strongly advise Waves users to read the attached document explaining the requirements to use Waves MultiRack on an external PC and ensuring that all of the necessary equipment and licenses are in place to do this before upgrading their console software. Did this news signal an impending end to the marriage between DiGiCo and Waves? How will this change affect my day-to-day operational experience? Using my DiGiCo SD5 FOH setup, how does the console address an external computer/display system to access the Waves MultiRack? Will I be able to use my existing .mrdb files on the external computer? How seamless will the complete upward migration process be? I was too busy at rehearsals to adequately research the implications of the software update. But during a break, I did phone my friend, Matt Larson, at DiGiCo’s USA office in hope of hearing a quick synopsis. Happily, Matt answered the call and he immediately assured me that there was nothing traumatic about the separation of Waves from the onboard processing. The existing healthy relationship between the companies remains unaltered. The change from shared onboard processing ultimately benefits both firms and allows each to independently enhance their platforms and introduce more new products. We next discussed the greater implications of the migration process from DiGiCo’s current software version v929 to v987. Matt’s explanations answered my most pressing operational questions. The best surprise was that the external processing computer communicates with the console via the Waves I/O interface card that already lives inside the SD5 console. The Waves MultiRack software will still be included in v987 and will still appear on the SD5 console’s center screen after enabling Waves and clicking the “Waves” tab on the Home screen. This news brought great relief to my concerns about workflow. I also expressed a concern about the possibility of additional plug-in latency resulting from the removal of Waves from the console’s central computer system. I was assured this is definitely not the case. The new system continues to employ the same Waves SoundGrid Extreme servers that are currently installed in my FOH electronics rack. Latency will still be <1 ms roundtrip and plug-in latency is measured in samples, not in milliseconds. Latency compensation options will still be available in the software menus. 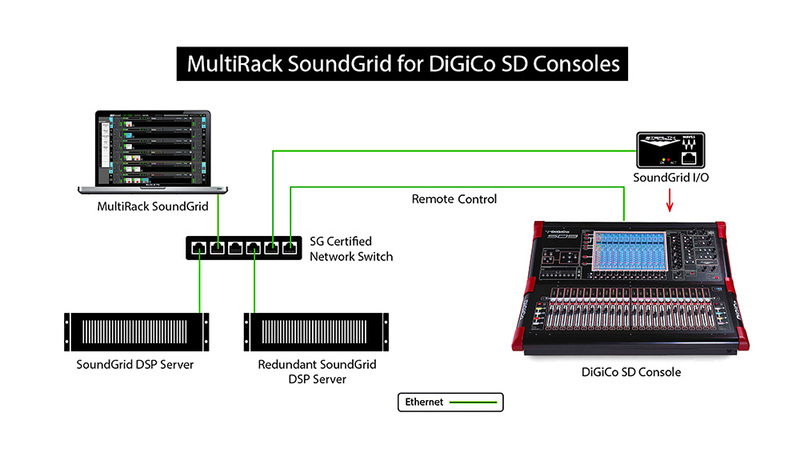 The use of redundant servers is still the recommended configuration for the DiGiCo SD5. By the end of the conversation, I shared Matt’s confidence that this change was a positive step that should yield more performance benefits in the foreseeable future. The decision to process the DiGiCo and Waves systems independently should result in an overall enhancement to the performance and reliability in the console’s onboard engine. The subsequent capacity to upgrade products individually will bring the future a bit closer for each firm by eliminating the complicated planning, testing and coordination of any proposed changes to the platform. My next call was to Steve Callebert, our operations contact at Clair Global. He informed me that since the introduction of the DiGiCo SD12 console, Clair has been anticipating this change in the DiGiCo/Waves integration system. That product was the first of the SD series consoles to eliminate onboard processing for Waves plug-ins. Considering the vast number of DiGiCo consoles owned by Clair at its various facilities around the world, this platform separation becomes a development of great significance. Adding an additional computer to each DiGiCo console setup for which Waves is required represents a significant capital investment. Steve let me know that Clair has chosen a Mac Mini as the host computer for Waves. When Clair Global moves forward with the system update for its DiGiCo consoles, the Mini will be securely mounted inside the dual 10-space rack on which my console sits. Doing any necessary file management tasks on the Mac Mini running a familiar OS is a positive selling point for me. Sadly, I remain woefully ignorant about working in Windows to this day. Steve also confirmed that everything about the console should feel operationally identical if not a bit enhanced. Retaining the center screen location to display the Waves MultiRack software is incredibly important to my mixing routine. I had initially projected that I may be required to adapt my work habits to include manipulating an additional interactive screen. My concern was about adding a new source of information and diverting my attention from the events on the stage during the performance. The Waves website offers this simple description of the environment after the v987 update is performed. Features, familiarity and functionality are retained. I have experienced success with the DiGiCo session file conversion process in the past, both moving between SD console platforms and adapting to various software updates. There are, however, some things I will need to check carefully. The migration process may cause my input channel strips to be returned to cardinal order. I experienced this when I converted SD5 files to SD7 files last year. My current SD5 setup has definitely evolved over the past five years and many channels strips have been swapped around. And if the input channels have indeed been re-ordered, then any Waves patches for those swapped channels may be wrong as well. Because I always anticipating growing pains and/or self-inflicted wounds getting any new setup to operate in its optimal mode, I will delay deploying any updates until I have a significant chunk of rehearsal time to implement and verify the v987 update on my touring FOH rig. Time for verifying converted SD5 .ses files, properly loading Waves .mrdb files and adapting to the new system configuration is essential regardless of the many predictions for a seamless transition. In the past, it has been essential to rename the .mrdb file with the exact same file name as the converted .ses file so that the Waves MultiRack is configured and populated correctly when the session file is loaded and the Waves information is dragged along. There is no plan to perform any console updates or to make changes in gear while we are currently on tour. I hope to incorporate the software and hardware changes while in rehearsal for my next mixing project coming up later this year. Look for an evaluation of the new Waves integration system for DiGiCo SD consoles and Waves in the September or October issue.